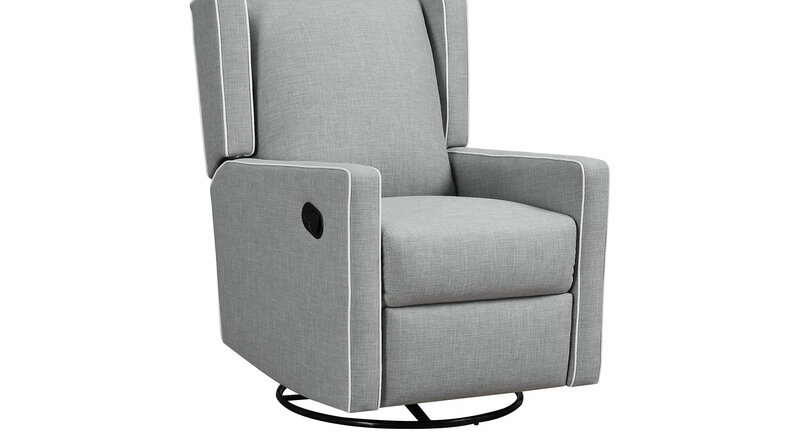 Combining functionality, style, and comfort the Innes gray swivel glider recliner is the perfect seating solution. The chair has a smooth gliding motion to effortlessly sooth your child to sleep and a rotating swivel function that is convenient for easy seated movement. With comfort in mind, this sturdy glider is made with a thickly padded seat cushion and backrest, and with a pull of the trigger will also fully recline for ultimate relaxation. Featuring a tranquil silhouette with comfortable track arms that elegantly blend into the softly tailored wings. The glider is upholstered in an easy-clean linen look fabric, with a beautiful contrasting welt detail that highlights the glider's sleek shape. Use the swivel gliding functions primarily in your child's younger years, and when the need for a nursery is gone, the recline feature and smart design will allow for it to be used in any room of your home.